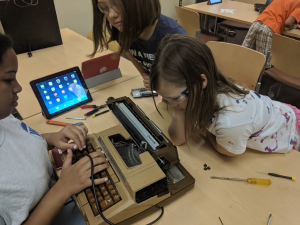 We’ve checked in with our Summer Youth Leaders here and here, and this is Pearl Bailey Library’s final post of the summer. The youth have helped serve the library and the community in a variety of ways, thanks to the generosity of the Dollar General Literacy Foundation and YALSA. They helped serve over 400 people at the Wickham Avenue Alliance Summer Ice Cream Social event, and assisted us in advertising the library’s services and collections at that event. 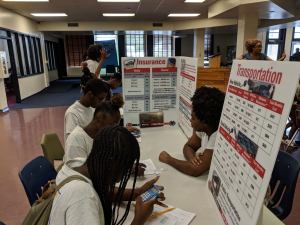 In addition they had fun participating in an “adulting” event called the Reality Store, where each Youth Leader had to manage a hypothetical family budget. In the library they helped us with our full slate of summer reading events and helped us keep the space and collections neat and tidy. They especially had fun helping children at our “Breaker-space” event, where youth looked at how everyday items such as computers work from the inside out. Everyone was fascinated by the typewriter. 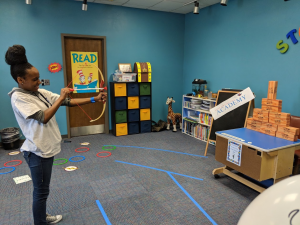 Our summer reading theme this year was superheroes, and Naquan, Sari, and Allysse constructed a “superhero training academy” for the children who successfully completed the summer reading program. In the photo below, Allysse is doing some quality assurance. 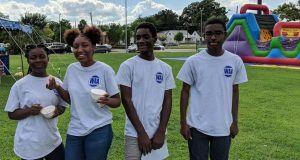 We’d just like to close by giving our thanks to our Summer Youth Leaders, to our partners in the Wickham Avenue Alliance, especially the C. Waldo Scott Center for HOPE, our local Dollar General Store Manager Tammy Mowrey, and to the Dollar General Literacy Foundation and YALSA. Thanks for making this summer great for the Pearl Bailey Branch of the Newport News Public Library! Have a great Autumn and see you come Teen Read Week! Zach Elder is the Branch Manager of Pearl Bailey Library, a branch of the Newport News Public Libraries.